Washington (AFP) – Donald Trump’s beleaguered White House was rocked Tuesday by a pair of explosive allegations — that he personally tried to quash an FBI investigation, and that he disclosed highly classified information to top Russian officials. The Republican billionaire’s administration, now just barely four months old, was left reeling by the one-two punch, which sparked instant outrage from Democrats demanding a full explanation. Either claim on its own — that he divulged top-secret information to Russian Foreign Minister Sergei Lavrov during an Oval Office meeting, or that he pressed FBI director James Comey to drop a probe into ex-national security advisor Michael Flynn — would plunge any White House into serious crisis. But the reports — both rebutted by Trump’s team — add to a mounting perception of an administration in a perpetual state of chaos. As overwhelmed White House staff struggled to explain Trump’s decision to tell Lavrov about a specific Islamic State bomb threat gleaned by Israeli intelligence, the New York Times dropped another bombshell. The paper — citing two people who read notes written by Comey — reported that when Comey met Trump the day after Flynn resigned, the president tried to halt any FBI investigation. 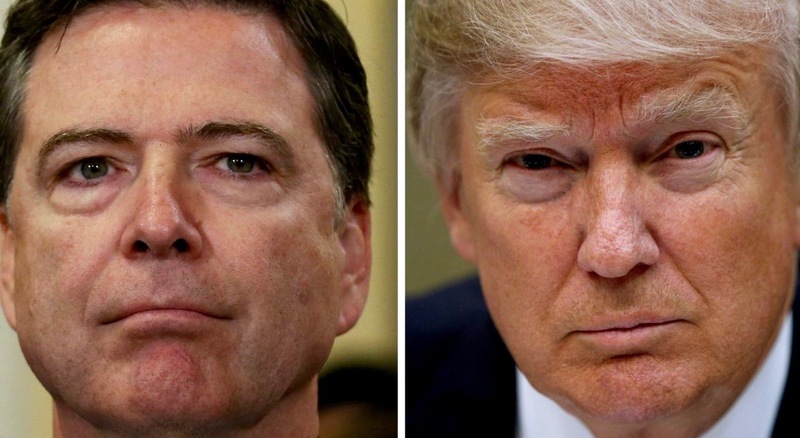 “I hope you can see your way clear to letting this go, to letting Flynn go,” Trump is accused of telling Comey, according to a memo written by the former FBI chief, who was sacked last week. In a letter to acting FBI director Andrew McCabe, the Senate Oversight Committee demanded that all memos and other documents or recordings relating to communications between Trump and Comey be turned over by May 24. “If true, these memoranda raise questions as to whether the president attempted to influence or impede the FBI’s investigation as it relates to Lieutenant General Flynn,” wrote committee Chairman Jason Chaffetz, a Republican. The White House quickly denied any suggestion that Trump was trying to obstruct justice — a criminal offense — in his dealings with Comey. “While the president has repeatedly expressed his view that General Flynn is a decent man who served and protected our country, the president has never asked Mr. Comey or anyone else to end any investigation,” a US official said on condition of anonymity. Trump spent much of the day trying to put to rest separate allegations that he revealed sensitive information to Lavrov and Moscow’s ambassador to Washington, arguing he acted within the law. White House aides refused to say whether the information pertaining to the group’s bombmaking capabilities was classified.